SOTHEBY'S, Fine oriental miniatures manuscripts and Qajar lacquer, London 1980. Auction catalogue 13th / 14th October 1980. Soft cover 24,5 x 18,5 cm. 135 pages with 315 lots, illustrated. SOTHEBY'S, Fine oriental miniatures manuscripts and Qajar paintings, London 1976. Auction catalogue 13th/14th April 1976. Soft cover 24,5 x 18,5 cm. 91 pages with 374 lots, illustrated. 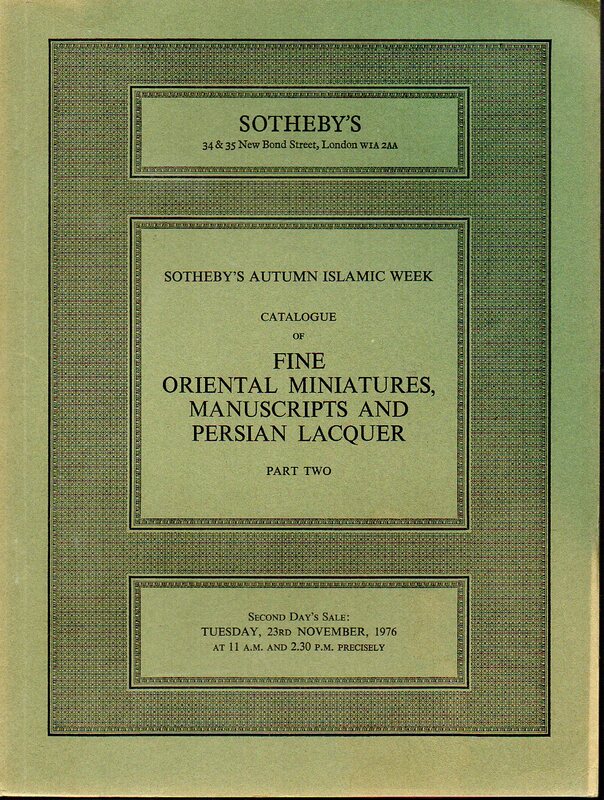 SOTHEBY'S, Fine oriental miniatures manuscripts and Qajar paintings, London 1978. Auction catalogue 4th April 1978. Soft cover 24,5 x 18,5 cm. 157 pages with 321 lots, illustrated. 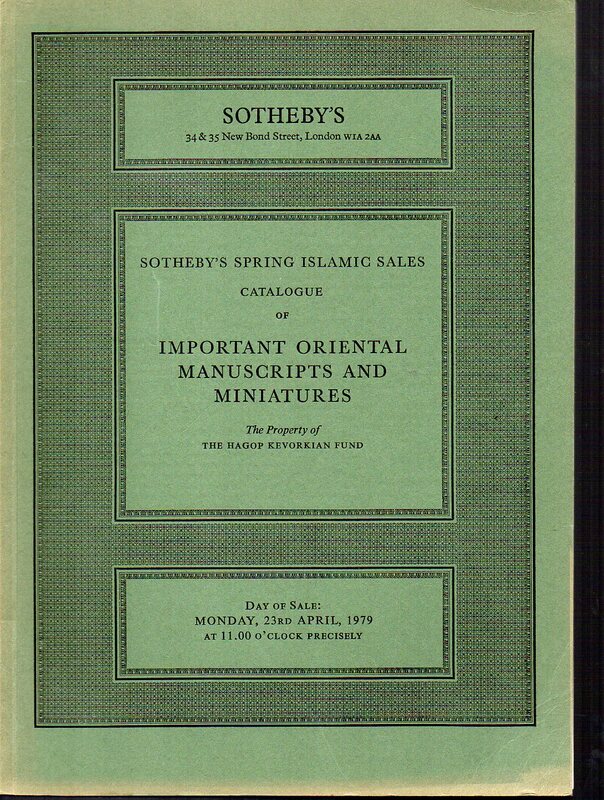 SOTHEBY'S, Fine Oriental Miniatures, Manuscripts and Persian Lacquer, London 1976. Auction catalogue in two parts 22 & 23 November 1976. Soft cover 24,5 x 18,5 cm. Part I: 41 pages with 245 lots, illustrated / Part II: 83 pages with 310 lots, illustrated. SOTHEBY'S, Important oriental miniatures, manuscripts and Qajar lacquer, London 1979. Auction catalogue 8th / 9th October 1979. Soft cover 24,5 x 18,5 cm. 175 pages with 333 lots, illustrated. A lot of 3 catalogues related to the Hagop Kevorkian Fund. 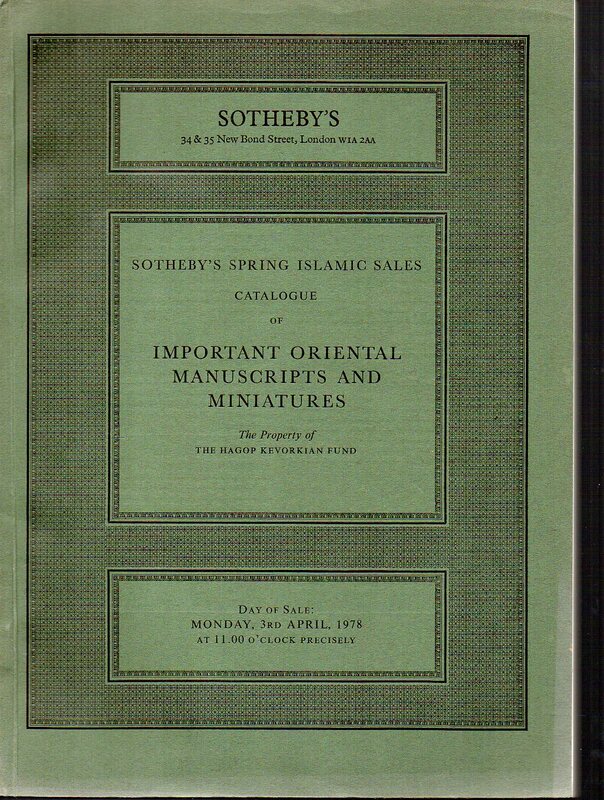 SOTHEBY'S,[Highly] Important Oriental manuscripts and miniatures, London 1967/ 1978/ 1979. Soft cover 24,5 x 18,5 cm. Illustrated. Sotheby’s, Highly important Oriental Manuscripts and Miniatures. The Kevorkian Foundation, London 1969. Sales catalogue December 1, 1969. Soft cover 24,5 x 18,5 cm. 101 pages with 202 lots; 87 plates(3 in colour) .